This German tradition honors our Blessed Mother during Advent. Another beautiful custom is to set up in the home the so-called "Advent Candle." 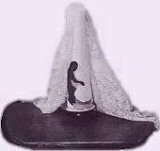 Into a candlestick, covered with white silk, is put a large candle, to symbolize our Immaculate Mother Mary from whom came the Light of the World. What an eloquent reminder of the mystery of the Incarnation of the Son of God born from the chaste womb of Mary, as this candle burns on the family home-altar while the family is at prayer evening after evening of Advent.